That's right...growing a human in my belly, so my brain has been a bit preoccupied with everything baby. We're expecting the arrival of our precious boy in about 8 weeks and we are thrilled!! Crafting and knitting and baking and making and all the usual things I talk about on here have been almost non-existent. So I will attempt in the coming weeks to keep you posted on this new adventure we're starting. 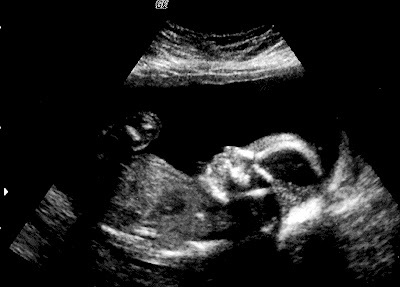 Here's the token ultrasound picture. I've never seen a cuter one. That is the number of baby hats I sent off to New York last week for the Infant Hats for India Project. Actually there were 48 turned in by the deadline, but I just had to make it an even 50 before I dropped them in the mail and, because it's faster, I FINALLY figured out how to crochet! Gasp! Yes, it took a project like this, and several youtube tutorials for lefties to teach myself. The interest was so high (some even learned to knit for the very first time just for this project!!!) I think I'll do another mailing sometime in March, but before you send them my way, I need to ask Jes if it would be better to have people send the hats directly to her in India or to just keep sending them to me...I'll keep you posted. Thanks everyone for helping out! Knitters and crocheters truly have giving hearts. A day late but we're all still celebrating right? I decorated our little tree (a real one for the first time) with handmade cranberry garlands, felt garlands, and clove decorated mandarin oranges. Super easy, super sweet. Beautiful, perhaps inspiring, but definitely beautiful. Yep!! One of our neighborhood owls!! I have a friend, Jes. Jes and her friend, Michelle, are midwives headed to India. They will be joining up with a monumental project. A Maternal and Infant Health Care Project in Bihar. Bihar has the highest maternal mortality rate in the world. Jes, Michelle, and their team will be providing holistic pregnancy, birth & post-partum care, and education in 40 rule villages throughout Bihar. I don't have hundreds or thousands of dollars to give to this cause. I am a friend who knits and has some extra yarn lying around. I have several friends that knit. Last year I had been doing some knitting for the Knit One Save One project for Save the Children, which sounds a bit similar to what Jes will be involved with in regards to reducing the infant mortality rate around the world through basic care and education. I really enjoyed being able to use my talent and give in this way, but kept wondering if there was some other organization or ministry I could do this for--one I had a personal connection to. Then in May, I received a newsletter from Jes and without really thinking I quickly sent her an email asking if the donation of handmade knitted/crocheted infant hats would be something useful and worth the effort. She quickly replied with an excited YES! This is a great idea and that her and Michelle had prayed specifically that God would give people creative, out of the box ways to parter up with them. As of today, Jes is still in New York awaiting her visa (pray it comes through quickly! ), but just emailed me saying she'd like to get the ball rolling on this anyway, and that she has a New York contact that will be meeting up with them in India mid-January and will be happy to take hats in their luggage. All that to say, if you'd like to knit up or crochet a few infant hats with me, let me know and I'll arrange to gather them up and mail them off to New York! My goal is to send them out the last week of December.